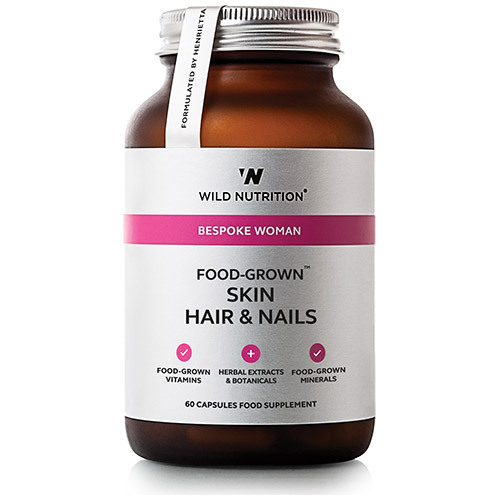 Wild Nutrition`s Food-Grown Skin Hair & Nails formula contains natural probiotics and antioxidants to support that inner glow as well as a bespoke blend of Food-Grown nutrients, whole-foods and herbal extracts. Key ingredients include: zinc and biotin which contribute to the maintenance of normal skin; vitamin C to support normal collagen formation; vitamin E, copper and manganese to contribute to the protection of cells from oxidative damage; sulphur to support connective tissue and the botanicals stinging nettle extract and ashwagandha; selenium and iodine which contribute to the maintenance of normal hair and nails as well as copper shown to contribute to normal hair and skin pigmentation. Iodine has the additional effect of supporting the normal function of the thyroid. Imbalances in thyroid function can contribute to hair loss. We all have our own natural and unique beauty and with Wild Nutrition firmly believing that beauty comes from within, this formulation has been designed to nourish you from the root up. Vitamin C incorporated in Citrus pulp; Mineral enhanced Yeast providing Sulphur, Vitamin E and Biotin; Lactobacillus bulgaricus* (from milk) providing Zinc, Selenium, Manganese, Iodine and Copper; Beta-Carotene and mixed Carotenoids (including Lycopene) incorporated in Carrot concentrate; Grapeseed extract, Stinging nettle leaf, Bilberry extract, French maritime pine bark extract (Pycnogenol), Gotu Kola extract and Ashwagandha powder. Below are reviews of Wild Nutrition Skin Hair & Nails - 60 Capsules by bodykind customers. If you have tried this product we'd love to hear what you think so please leave a review. Have been buying this one already for a while. It is pricey and only provides a month supply. Have not seen a visible improvement with regard to hair loss and the growth of new hair, but it definitely has not got worse which is a good sign.